Birthday Parties at Crock A Doodle, Fun for Everyone! Looking for a Creative Idea for your Child’s Birthday? Celebrate with Crock A Doodle Paint your own Pottery. Kids love it. Parents love it too! Our birthday parties offer colourful and creative fun for girls and boys of every age. From preschool doodling to tween and teen technique parties, and everything in between. Kids will get creative and enjoy some hands-on fun creating their own amazing pottery pieces…art that they can use. Best part of all…you’ll create birthday memories and pottery pieces that will last forever! We have endless creative party ideas and theme options to suit every kind of birthday celebration! Party pricing is based per child, based on the pottery piece(s) selected. Pick your package or price point in advance or let the kids mix ‘n’ match on the day of the party. Choose from our fun and fabulous birthday party packages – perfect for kids of every age! Package includes an 8″ art tile for each guest. 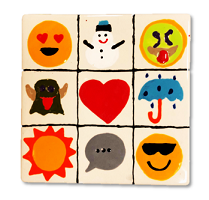 Tiles offer the perfect canvas for capturing imaginative art and one-of-a-kind ideas. 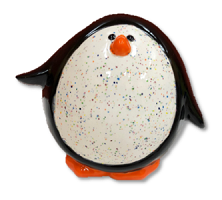 Kids can design their own masterpiece, follow a popular party theme or explore one of our cool pottery painting techniques. $20 per child. Package includes a choice of our in-studio selection of party animals…fun and adorable pottery designed after favourite furry (or sometimes slimy) friends. Little ones love these! $22 per child. Package includes a choice of fun and functional pottery pieces including ice cream bowls, cocoa mugs, handi-plates, cereal bowls, cupcake plates or mugs. Kids can create pieces they can use every day! $24 per child. Package includes choice of our in-studio selection of pudgy pet banks. These banks offer creative form and function…with extra pudginess that make them extra cute! $26 per child. Package includes choice of our all-time favourite kids’ pieces including piggy banks, dogs and cats, cupcake boxes and more. These are hugely popular with every age! $28 per child. Package includes choice of the biggest and best pottery pieces from our kid’s lineup. The extra size and extra detail of these premium pieces makes them extra special. Always a BIG hit! $30 per child. Please note – pottery pieces, product selection and packages may vary by studio.